Swimwear and suntan lotion? Check. Camera? Check. Camera charger? No need. There’s a lot to remember when packing for vacation but a new digital camera from Casio could mean one less thing in your baggage. The Exilim Hi-Zoom EX-H10 can shoot 1,000 images on a single battery charge—enough, says Casio, to last most people through their vacation so packing the charger and additional cables and adapters could be a thing of the past. The camera’s battery life, measured against a Japanese industry benchmark, is about three times longer than other cameras in the same class. So, for example, a user could shoot 140 images a day over a week-long trip and still have enough juice for a couple of snaps on the trip home from the airport. The Camera and Imaging Products Association battery benchmark is designed to mirror actual use and involves zooming in and out and setting the flash on and off between many images so the results are hoped to be close to what users can actually attain. It should be noted that the Casio camera isn’t the first to manage a 1,000 images. Digital SLR (single lens reflex) cameras can do the same but they’re bulky and heavy and not aimed at the same market as the new Exilim. Nikon offered a compact camera, the Coolpix L14, in 2007 that managed the same battery life and compared to that Casio’s camera offers newer features that you’d expect on a newer model. 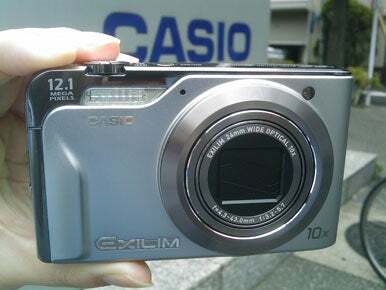 Casio has also built a couple of other functions into the camera that could appeal to vacationers. For close-up shots of large buildings or scenic views the lens has a wide-angle starting at 24mm, which allows for a wider shot than many competing cameras that start at 28mm. And a button on top of the camera allows one-touch access to “landscape mode,” which invokes digital processing in the camera to enhance landscape images and has been improved from an earlier version of the technology. The previous generation system applied a uniform enhancement across the entire picture but the new version picks and chooses which areas are enhanced and by what degree so, for example, trees in a shot of a valley are made to appear a more vibrant green while dark areas of shade are left untouched to maintain contrast. The landscape mode also works to great effect in cleaning up a lot of the effects of mist or smog that hangs over many cities so a city scape looks brighter and clearer. It’s the kind of thing that can be done in Photoshop or similar photo retouching software but now it’s in the camera. The camera shoots 12-megapixel resolution images, has a 3-inch display on the rear and can also record 1,280 by 720 resolution high-def video in the Motion JPEG format at 24 frames per second. However, there’s no HDMI-output for hooking up to a high-def TV so users will have to view the files on the camera’s monitor or transfer them via a PC. The new Exilim measures 102mm by 62mm by 24mm and weighs 164 grams without the battery. It will launch in Japan on July 3 and will cost around ¥40,000 (US$408). Launch plans for other markets are due to be announced soon.